The Overfair Railway, a one-of-a-kind miniature railroad, ran between Fort Mason and The Presidio in 1915 San Francisco. It had been designed and built by Oakland inventor Louis M. MacDermot to provide transportation within the 635-acre Panama-Pacific International Exposition (PPIE). MacDermot’s life is a riches-to-rags story of a man obsessed by all things mechanical. His steam locomotives continue to operate today at the volunteer-run Swanton Pacific Railroad in Davenport, near Santa Cruz, California. Louis Main MacDermot (1877-1948), grew up in a palatial home with manicured gardens that occupied an entire city block. His family wintered at San Francisco’s Palace Hotel, summered at their 20,000-acre Morgan Hill ranch and at Monterey’s Del Monte Club, and traveled extensively to the East Coast and Europe. Their wealth came from Louis’s grandfather, California pioneer Charles Main (~1814-1906), founder of Main & Winchester, a saddlery and harness manufacturer. Main diversified into real estate, railroads, cable cars, and insurance, among other investments. Main Street in San Francisco and Alameda were named after him. Louis’ father, Charles F. MacDermot (~1836-1898), who was appointed to the first Parks Commission for Golden Gate Park, got rich from mining and other business ventures. After C. F. MacDermot escaped being killed at gunpoint by another woman, he took his bride on a long trip to Europe where his first child Mary was born. Similarly, his youngest child, Alfred, was born abroad on a multi-year trip upon the exposure of a mining-stock swindle. Louis’ life was all about luxury, travel, innovation, fairs, and celebrations. In 1895, his father had men working in their home’s carriage house on a new invention: electric torpedoes. That year, eighteen-year-old Louis displayed an engine at the first Oakland Exposition. Later, he designed magnificent electrical lighting for his mother’s 600-person fundraising garden parties, many to benefit San Franciscans after the 1906 earthquake. And he added tiny twinkling lights to his wife’s gown when she dressed up as “Goddess Electra” on Mardi Gras. He also built a boat and a motorcycle, both steam-powered, obtained a patent for a steam trap, and tried to trademark the term “steam trap.” In 1910, to the chagrin of Louis’ two younger siblings who also lived at the parental home most of the time, his widowed mother indulged him with a huge machine shop where he built lightweight aircraft engines designed for long-distance flight. He owned a biplane that flew at Selfridge Field (at Tanforan, Burlingame) and hoped to compete for the $50,000 Hearst prize for the first coast-to-coast flight in fewer than 30 days. Louis M. MacDermot’s technical aptitude, social connections, and deep pockets made him the logical choice for the PPIE when it needed a railroad with 10 locomotives and 75 passenger cars to handle transportation needs within the fairgrounds. He set out to design and build the locomotives at home and assembled the railroad cars in a large building nearby. However, during the course of construction, PPIE management expressed concern about pedestrian safety in crowded areas and found more convenient means of transportation. Consequently, the railroad’s route was relegated to the very edge of the fair, thus reducing its economic potential. Just three Pacific-type locomotives and one switching engine made it to the PPIE. (One incomplete locomotive remained in Oakland, later to be restored for display as the iconic locomotive in the lobby of the California State Railroad Museum, Sacramento.) PPIE management further compromised railroad revenues when it shut down the railroad on particularly busy days and for special events. Making matters worse, his mother, who was his source of funds, died intestate in October 1914. Louis’ siblings banded together in an embarrassing public court battle that would not be settled until 1916. His younger siblings, Flora and Alfred, moved the household staff, the Pierce Arrow limousine, the investment portfolio, and the garden parties to a new home in Piedmont. His older sister Mary, a famous author, claimed her grandmother’s jewels and returned to her home in Kent, England. (Her previous home in Washington, D.C. became the Spanish Embassy.) Louis was left with the old house, 54 acres of Piedmont Park, a concession from his mother’s bad loan to real estate developer Frank C. Havens, and the section of Alameda Point bearing his grandfather’s name. The grand winner was Alameda County with the largest inheritance tax purse ever collected. The home’s carriage house was turned into a factory. Notice the 1912 Pierce Arrow limousine in the right garage, a locomotive boiler to the left, and completed passenger cars inside. While his siblings fared quite well, Louis’ portion of the estate could not sustain him. In 1920, he made an unsuccessful attempt in court to recover one of his mother’s other bad loans. As his inheritance dwindled away, the City of Oakland offered to buy his childhood home and convert it into a branch library and park; but after years of waiting, the City reneged on its promise. In 1930, Louis sold off specimen trees to Hillsborough estates, telling newspaper reporters that he was clearing his land for a pee wee golf course. Although he was granted property tax amnesty, it wasn’t enough to save his home. Through it all, he remained involved with trains, helped install the miniature railroad at the Fleishhacker Zoo (now the San Francisco Zoo), and made friends with railroad enthusiasts. Louis kept photos from his youth. Among them are photos with his family, the Paris Expositions, the 1901 New York World’s Fair, and his steam-powered boat, The Petrel. Around 1940, Louis and his wife, Hortense (~1884 – 1946), moved with their railway equipment to the new Alameda County Zoological Gardens (now the Oakland Zoo) where Louis ran a train ride business. When it failed, their friend Billy Jones, a retired Southern Pacific Railroad engineer, took them in. At Jones’s prune ranch, a group of volunteers built “The Wildcat Railroad,” later moved to Oak Meadow Park, Los Gatos. With Louis driving in the “golden spike,” his PPIE passenger cars were put back into service. Paradoxically, Louis said that his happiest years were those with his railroad family, living in a converted playhouse in the backyard of Charlie Hoyle, another Southern Pacific Railroad veteran. Today, Louis’ locomotive legacy continues to delight visitors and impress a new railroad family of volunteers at Swanton Pacific Railroad. Rhoda Fry is a volunteer at Swanton Pacific Railroad where her husband and son are also volunteers. Swanton Pacific Railroad, located in Davenport, about 15 miles north of Santa Cruz, California, is a volunteer-run railroad that maintains and operates the steam locomotives from the 1915 San Francisco Panama-Pacific International Exposition Overfair Railway. 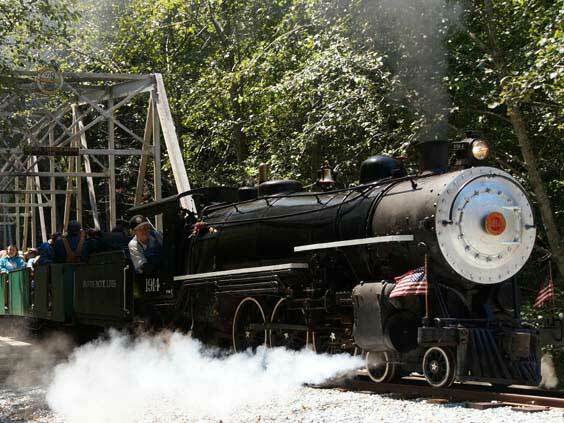 The railroad is open to the public for special events, volunteer days, and by appointment.